Almost everyone enjoys indulging in something sweet at Halloween, but the highly refined sweeteners in most treats are empty calories, stripped of fiber, vitamins, minerals, and phytonutrients. 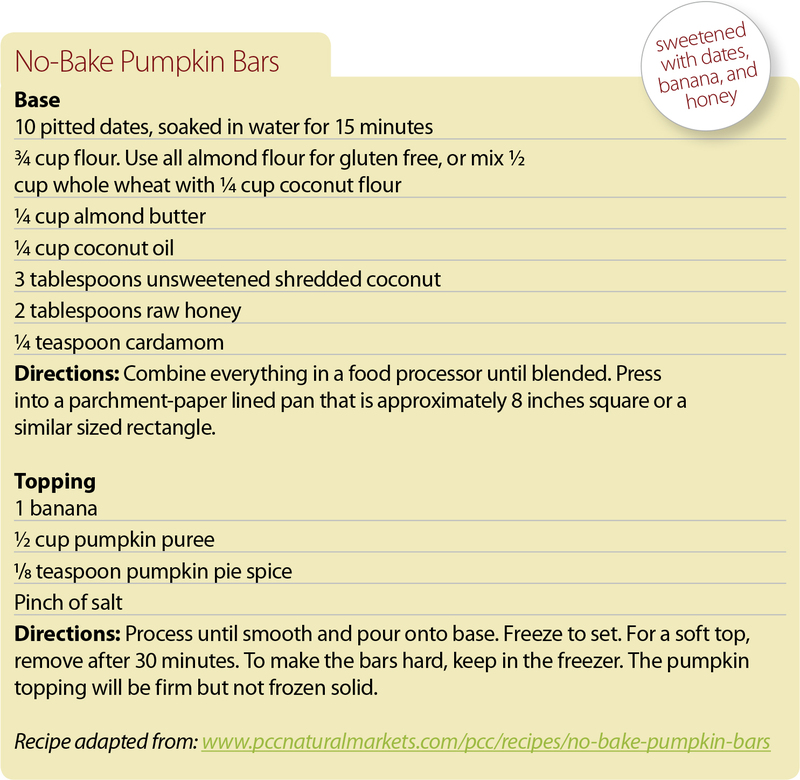 Fortunately, there are several healthier and delicious alternatives, such as dates, coconut sugar, and more. There are both health and taste advantages to using less-refined sweeteners closer to their whole-food forms. They retain some vitamins and minerals required by the body to metabolize sugars. Further, they are absorbed more slowly into the bloodstream and are less likely to cause highs and lows in blood sugar levels. In terms of taste, if the only sugars you’ve used are highly refined sweeteners, you’re in for a treat. There is a vast range of more natural sugars, each with its own unique taste and texture. Tastes range from sultry and caramel-like, to earthy, to reminiscent of butterscotch. Textures range from large grains, which make the ultimate crunchy topping, to smooth and moist. Here are some favorite sweeteners to consider using in your Halloween treats and fall desserts, with some details about what makes each stand out and some great recipes to follow. One hundred percent whole-food sweeteners like puréed dates retain all their fiber and nutrients. Dates are rich in vitamins and minerals, including potassium and magnesium, and their high fiber content slows sugar absorption.2 Puréed dates can be often be substituted for white sugar and help create a delicious, moist texture in baked foods. To substitute for one cup of sugar in a recipe, pit one cup of dates and cut into small pieces. Place in a blender with one-half to one cup of hot water and puree to a thick paste. Reduce liquid in the recipe by one-quarter cup. Date sugar, available at natural food stores, is made of 100% ground, dehydrated dates. Some brands add oat flour to make it free-flowing, others add oil for softness. Date sugar does not dissolve, but is delicious in baking and crumb toppings. It contains the same nutrient value as dried dates and tastes and looks similar to sugar, but is less sweet. 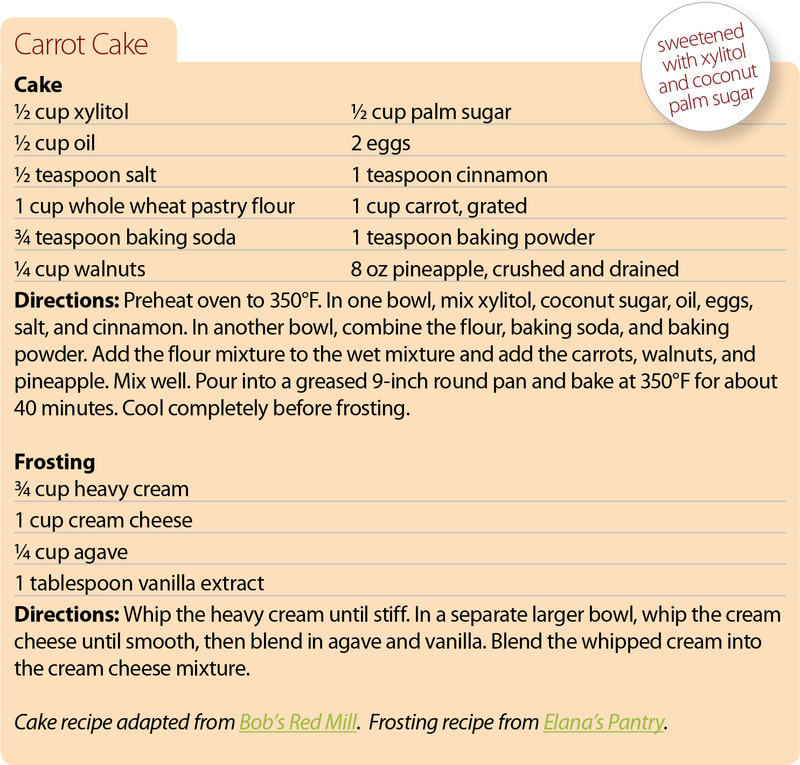 Date sugar works especially well in baked goods and can be substituted cup for cup for white sugar. This sweetener is made from the flower blossom nectar of the coconut tree, which is boiled into a thick caramel and ground into fine crystals. With a flavor similar to mild brown sugar, coconut sugar is low on the glycemic index and will not spike blood sugar like many other sweeteners. It is high in potassium and other nutrients. 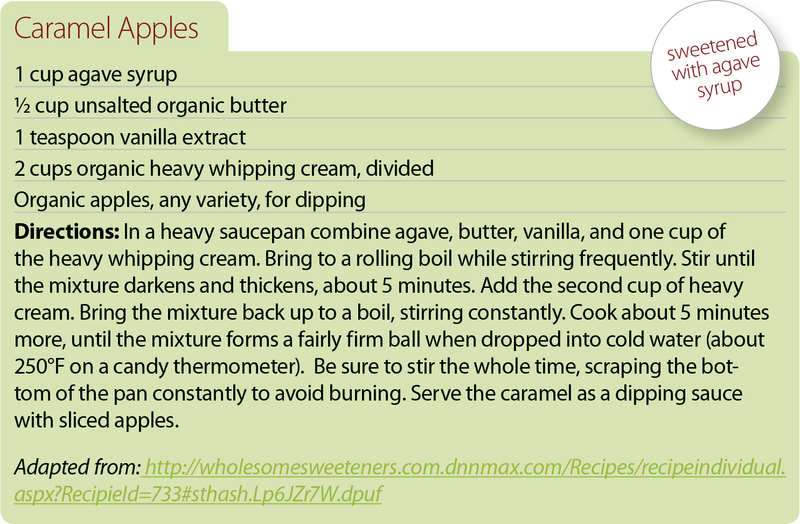 It can be used in place of refined white sugar in recipes; it mixes exactly like sugar as a one-to-one replacement. Agave syrup (or nectar) is a sweetener made from the sap of the Mexican agave plant. Different brands use different species of the plant and have different processing methods. Non-heat processing theoretically preserves enzymes and may be more healthful. Agave syrup is about 25% sweeter than sugar and the darker the agave, the more robust the flavor and the more it contains a hints of molasses. Agave is non-crystallizing and dissolves quickly in hot or cold beverages. Substitute three-quarters of a cup of agave syrup per one cup of white sugar. If baking, reduce other liquids in the recipe, lower the temperature by 25 degrees F, and bake a few extra minutes. Excessive fructose in the diet can raise triglycerides (implicated in heart disease), and contribute to fatty liver disease and metabolic syndrome.5 Whether agave also contributes to these diseases because of its high fructose content has not been directly studied in humans and the few animal studies show conflicting results. Given the controversies regarding diets high in fructose, it may be wise to limit your agave syrup consumption to the occasional treat. This syrup is made from rice that has been soaked, sprouted, and cooked with an enzyme that breaks the starches. 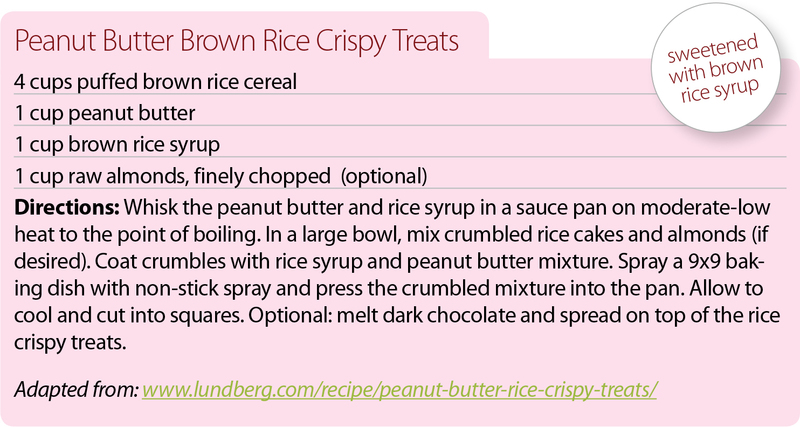 Brown rice syrup has a light, delicate ­flavor that some people describe as similar to mild butterscotch. It looks like honey but is less sweet (and about half as sweet as white sugar). It is good for cooking, baking, and in drinks or marinades and can be substituted one to one for honey and maple syrup, or substituted one to one and a half rice syrup per one cup sugar. Be sure to read labels because some brands include corn syrup. This alternative sweetener is naturally found in very small amounts in fruits and vegetables (plums, strawberries, cauliflower, and pumpkin). Xylitol is classified as a sugar alcohol, which has a different chemical structure than sugar, provides fewer calories, and has less effect on blood glucose (blood sugar) than other carbohydrates. It tastes similar to cane sugar, is low in calories, and does not cause cavities. Furthermore, xylitol has prebiotic effects, which means it acts as a food source for healthy gut bacteria.8 It may have a laxative effect or cause gas until the body becomes accustomed to it in larger quantities. The xylitol-to-sugar ratio is one to one and it is interchangeable with sugar for most cooking applications, although it will not work when baking breads or anything that contains yeast. Stevia is derived from a perennial shrub with leaves that are extraordinarily sweet but contain no sugars. Extracts of the leaves can be up to 300 times sweeter than sugar. Beyond being calorie free, stevia extracts may improve blood sugar regulation.9 They are available as a powder (loose or in packets) and as a liquid concentrate. Although many people complain about a bitter aftertaste with stevia, the bitterness and lingering aftertaste vary tremendously from brand to brand and formulation to formulation. These days there are a number of brands that claim to use extracts, such as NuNaturals stevia products, that eliminate this effect. Since different stevia brands and formulations have different sweetness levels, there’s no general sugar/stevia conversion formula. See the product’s package and the brand’s website for information on how to use diffserent tevia products in recipes. 1. Evid Based Complement Alternat Med. 2013;2013:718049. 2. USDA Nutrient Database. Dates deglet noor. 3. USDA Nutrient Database. Agave syrup. 4. J Am Diet Assoc. 2009 Jan;109(1):64-71. 5. Nutrients. 2013 Jul 26;5(8):2901-23. 7. Physiol Behav. Dec 7, 2009; 98(5): 618–624. add, alcohol, antioxidants, bacteria, blood sugar, blood sugar levels, calories, cauliflower, cooking, corn, corn syrup, dates, diet, ed, empty calories, fatty liver, fiber, food, glucose, Glycemic index, gut bacteria, health, healthy gut, heart disease, high fiber content, honey, liver disease, magnesium, metabolic syndrome, metabolism, natural food stores, nutrients, phytonutrients, potassium, potassium and magnesium, recipe, stevia, studies show, sugar, sugar levels, the glycemic index, Triglycerides, vegetables, vitamins, vitamins and minerals, vitamins minerals, whole food.